Dynamometer Range at Mentone Educational - Browse Online Now! A dynamometer is engineered device for measuring mechanical force, or power, transmitted by a rotating shaft which is generally used for measuring the power output of an engine. Discover All You Need to Know About the Dynamometer! Mentone Educational is pleased to offer a wide range of dynamometer “dynos”, a device for measuring the grip and strength of all regions of the body. Our range of dynamometers for sale are of clinical standard and are perfect for medical professionals to assess and measure strength of a patient post-trauma or during a rehabilitation process. The dynamometer is a handheld device for measuring the strength and the grip of a patient. It is commonly used by physiotherapists, osteopaths, and even physicians to evaluate a patient. Dynamometer are frequently used in medical environments and are more than just a handheld device for measuring a patient’s strength and grip. In fact, the handheld dynamometer can also be a device for measuring a patient’s progress during rehabilitation; this after a car accident where the patient suffered serious injuries, post-surgery, or even after the patient suffered cardiac arrest. It is also a handheld device for measuring strength and grip in patients suffering from arthritis. The applications for a handheld dynamometer are endless in the medical world. Therefore, many clinicians and medical professionals will have a dynamometer in their arsenal. How Do You Use a Dynamometer? Using a dynamometer is subject to the type of dynamometer you have obtained. To help clarify this, we have created an overview with the various types of dynamometers and their respective uses. 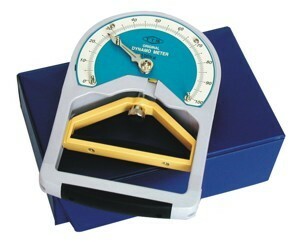 Hand Dynamometers (Dyno) - We are pleased to offer a range of analogue or digital hand dynamometers. Our Advanced Hand Dynamometer (PE022) is the gold standard in measuring grip strength and is used by the Australian Police to measure hand strength. Our range is also used by physiotherapists and osteopaths in a hospital setting to assess a patients strength and their process of recovery. Back Dynamometer - Manufactured in Japan, this back Dyno is utilised to test back strength and is used frequently by sporting clubs to assess strength. Shoulder Dynamometer - Utilised for testing shoulder strength. Pinch Gauge Dynamometer - Used to test finger strength. What Is the Grip Dynamometer Test? During a grip dynamometer test, a medical professional will determine the maximum isometric strength of the hand and the forearm muscles. The test finds numerous applications in the medical world, but also in the world of sports, since handgrip strength is important for sports that involve any form of catching, throwing, or lifting. What Dynamometer Brands Do We Stock? Mentone Educational is pleased to offer a range of dynamometer brands including TTM, which are Japanese quality, Jamar and Baseline. All our products meet Australian clinical standards.